Vita Coco Coconut Water - Our Favorite! Vita Coco Coconut Water is our featured coconut water drink!! It contains greater amounts of electrolytes compared to other commercialized sports drinks and it is very natural, as if you are drinking from a fresh young coconut. With this Coconut Water Vita Coco has created a product to suit not only athletes but anyone that needs proper hydration and electrolytes. This is very important because everyone loses both water and electrolytes during everyday living. In 2004, Vita Coco Coconut Water was brought to several stores along the East Coast. Since then, it has become one of the fastest growing lifestyle beverages in North America, and can be found from east to west. Some of Vita Coco’s competitors have moved to a less-natural, concentrate-based formula – and there is a serious sacrifice of taste, flavor, and nutritional value in those products – but not with Vita Coco. Vita Coco Coconut Water remains completely natural, delicious, and nutritious. 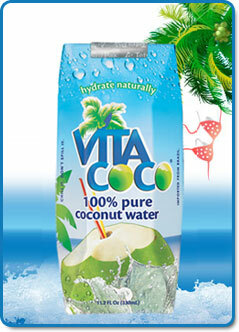 Vita Coco coconut uses green coconuts in producing fresh and quality drinks. They use a perfectly-timed seven-month old coconut because this is the best time to harvest the sweetest fruit water since it is still fat-free at this point. Vita Coco then pasteurizes the coconut water for a few seconds before packing it in a perfectly sterile Tetra Pak container. The shelf life of Vita Coco Coconut Water is 12 months but it is advisable that you consume it within 24 hours once you have opened it. Vita coco coconut water contains five essential electrolytes which include potassium, magnesium, sodium, phosphorus and calcium. These keep you fit, hydrated and even lower your blood pressure when taken regularly! Vita Coco Coconut Water contains 15x more potassium than a banana. These electrolytes sustain your body, boost your circulation, replace your fluids after a work-out, and assist in the cleansing process while strengthening your immune system response. 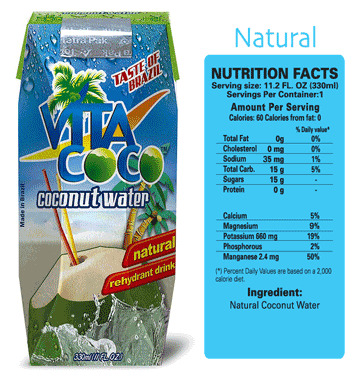 Vita Coco does not use additional sugar although they use natural fruits to add flavors to their other products. It is fat-free and cholesterol-free. Vita Coco has also been shown to help you to drop bodyweight when you replace other sugary juices and/or sodas with it. Vita Coco Flavors – Try Vita Coco Coconut Water with Pineapple! Vita coco coconut water is available in various types of flavors and packages. Natural is the most popular flavor, but followed by that is the pineapple flavor, which we absolutely love. You can see all of the flavor price comparisons below. This is our featured coconut water for a reason. Great taste, pineapple rocks, amazing prices, and no chance of it being made from concentrate! Vita Coco Coconut Water reviews across the net also reveal an excellent rating from hundreds of customers. It was evident in several posts that this truly helps its users in maintaining a fit, healthy mind and body. hello! :) I’m at the office right now, so i don’t have very much time to write… but! I truly liked reading through this post. It was some excellent stuff. many thanks! Didn’t they just do a consumer report about how VC and ONE lie on their nutritional facts? They said VC has almost 50-70% less, as far as the electrolytes go, than what’s stated in their package. I will have to try this. I put a half cup of fresh sliced rtbawrersies in a 3 cups of water kefir and left it at room temp over night. I strained it and poured it over ice the next day and it was super fizzy, tasted like a light strawberry soda and was super yummy. It did have a slightly higher alcohol content, maybe 2%. I have made some water kefir that neared 4% before. Any time you do a second fermentation at room temp with a sweet fruit you will get a higher alcohol content.